There comes a point in any canoe build when the sight of a sander invokes a sigh. You’ve sanded diligently. You’ve gone over the places that you missed the first time around. You’ve spot sanded because, in spite of your best efforts, there were still places that you’ve missed. And you’ve heard your wife complain again about all of the dust that you’ve tracked into the house. It is at this point that you say to yourself: Enough is enough. Time to varnish. This is an exciting time. 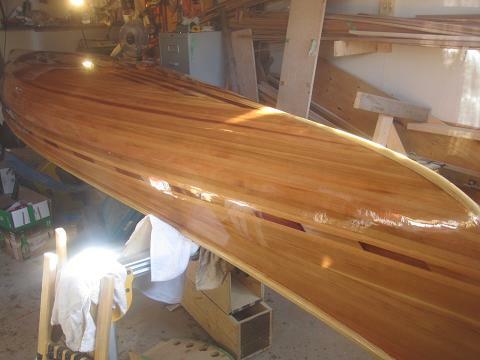 It’s the time when the wood that has lain muted beneath a layer of fiberglass and epoxy leaps forth. It’s also a time when the mistakes you’ve made leap forth as well. Finally, it’s a time when the reek of varnish replaces the inconvenience of dust in your house. Before sanding, I washed down all surfaces and then wiped the hull down using a tack cloth. For this build, I decided not to obsess about lint and dust. I obsessed the last time and still got lint and dust in the varnish. Regrettably, I don’t have a dust free work area and it would have taken the better part of my mid-life crisis years to make it so. So I vacuumed and dusted as best I could and then left the final product to the vagaries of whatever draft happened to waft over my canoe. For the first coat, I used Epifanes clear varnish, diluted a little with a splash of thinner. Later coats will be diluted less. 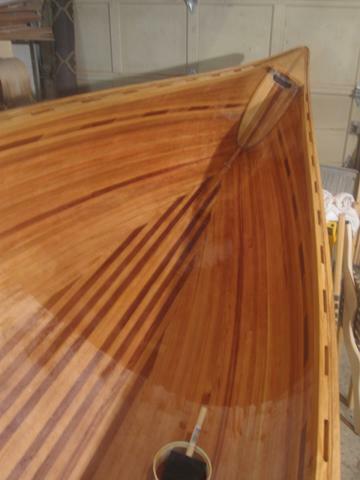 The following pic shows how the colors pop under the varnish. 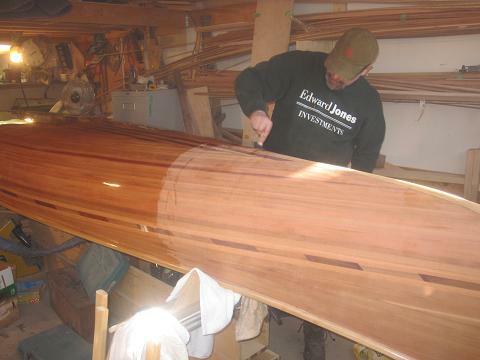 You are currently viewing the archives for January, 2012 at greybeard canoes & kayaks.